If you have ever tried Spotify on mobile, you’ll probably know that free users aren’t allowed to stream on-demand music; this feature is only limited to Premium subscribers. 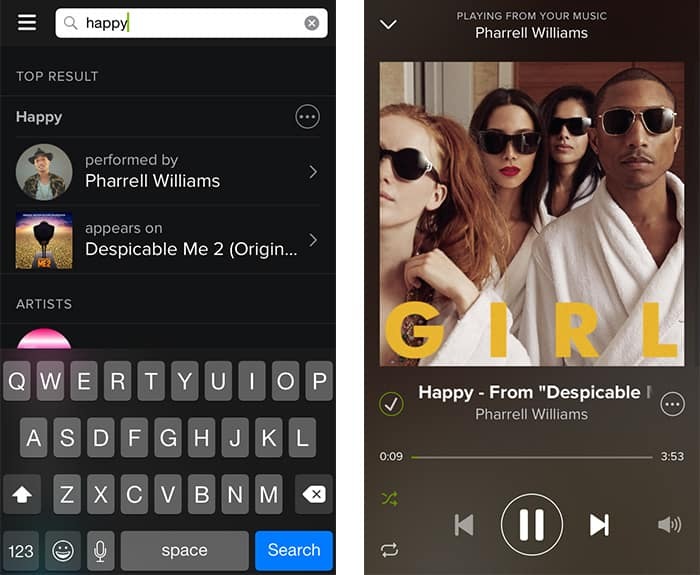 Using the mobile app, Spotify Free users may search for music, create playlists or save (bookmark) songs and albums to “Your Music” section, but they cannot select a particular song and listen to it. Instead, they can only shuffle through a particular artist, album or playlist using the Shuffle Play button. Even if you try to shuffle a playlist containing only one song, Spotify will usually play another song related to it. But while exploring Spotify on mobile today, we found a workaround that makes on-demand streaming possible even without a Premium account. Here is what we did to play a particular song (on-demand) on Spotify using the iPhone and Android app. Download and install the Spotify app on iPhone or Android. Open Spotify and search the song that you want to play. Select a result from the Top Results, Artists or Albums section. This will take you to the respective album or artist page. Save your searched song by swiping it to the left or selecting Save from the song options. Tap on the Shuffle Play button to play a random song from the list of available songs. Go to Menu >> Your Music. The artist or album of your selected song should be available under Recently Played list . Open it to access the song list. This list should only contain the saved song(s) of the corresponding album or artist. Now tap on Shuffle Play. If the list contains only your selected song, it should now begin playing. “Your Music” view on Spotify shows all the Songs and Albums that you have bookmarked using the Save option. If you open any artist or album from the Recently Played list (under Your Music), usually it will take you to the respective page with the complete list of items (songs, albums, playlists, etc.). But if a recently played album or artist includes any of your saved songs, the corresponding page will only display your saved items. Tapping on Shuffle Play will now randomly play songs from your respective saved items. To play a particular song from a recently played album or artist, you have to remove all other saved items that might be present on that list. Since the list only contains one song now, tapping on Shuffle Play will play that particular song. However, the same trick won’t be applicable for individual albums or playlists. The aforementioned workaround may even work for Windows Phone devices, though in our tests, we were not able to get any reliable results. You can try this on your Windows Phone and let us know if it works. This workaround has been tested using the latest version of Spotify app for iOS and Android on 21 February, 2015. If it’s a bug, Spotify may fix it soon.